KIEV, Ukraine -- The Russian language is stronger than Ukrainian and would become the country's main language if it was given official status, Ukrainian parliament Speaker Volodymyr Lytvyn said on Saturday. 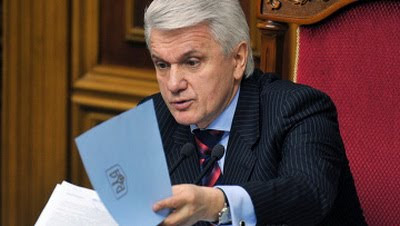 Ukrainian parliament Speaker Volodymyr Lytvyn. The question of Ukraine giving official status to the Russian language has become a matter for heated debate since Viktor Yanukovych was elected president in February on the back of strong support in the mainly Russian-speaking east of the country. "I am convinced that we need to put an end to the discussion of this topic," the speaker of the Supreme Rada said. "We are well aware that in the present situation, if we assume hypothetically that Russian becomes a second state language, we would actually be left with one state language - Russian. The Ukrainian language cannot withstand competition in the scientific sphere, in the field of information, and in communications," the parliamentary press service quoted Lytvyn as saying. Yanukovych's election victory showed a clear split between the pro-Russian east of the country and the more nationalist west, where his opponent, Yulia Tymoshenko, won most votes. A similar divide was seen five years earlier, when Viktor Yushchenko was elected president at the expense of Yanukovych.